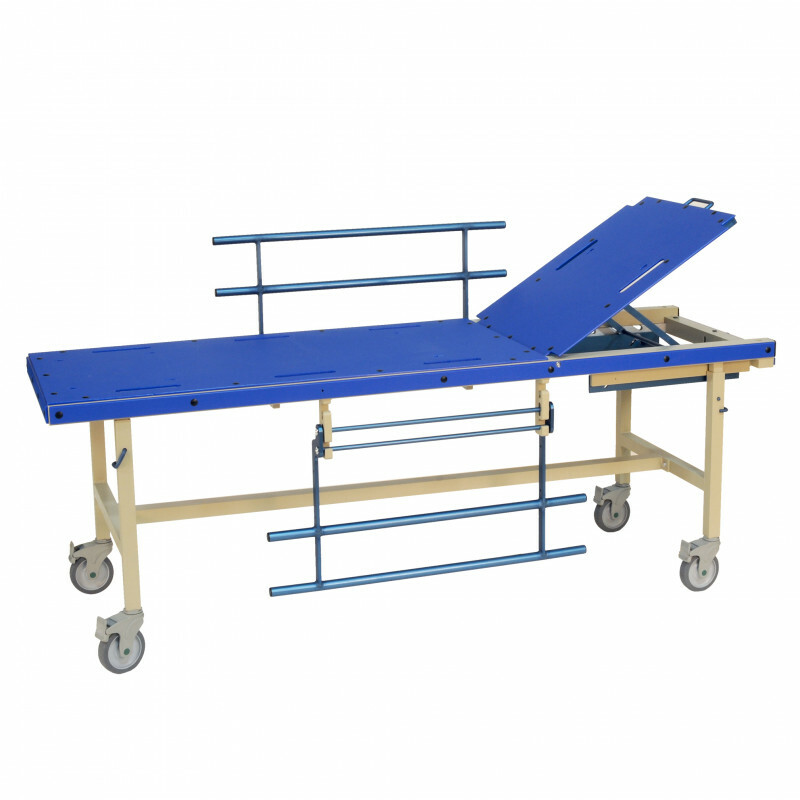 Bed, Manual, MR/TBI/HDR with 0-60° Fowler Positioning - Radiation Products Design, Inc. 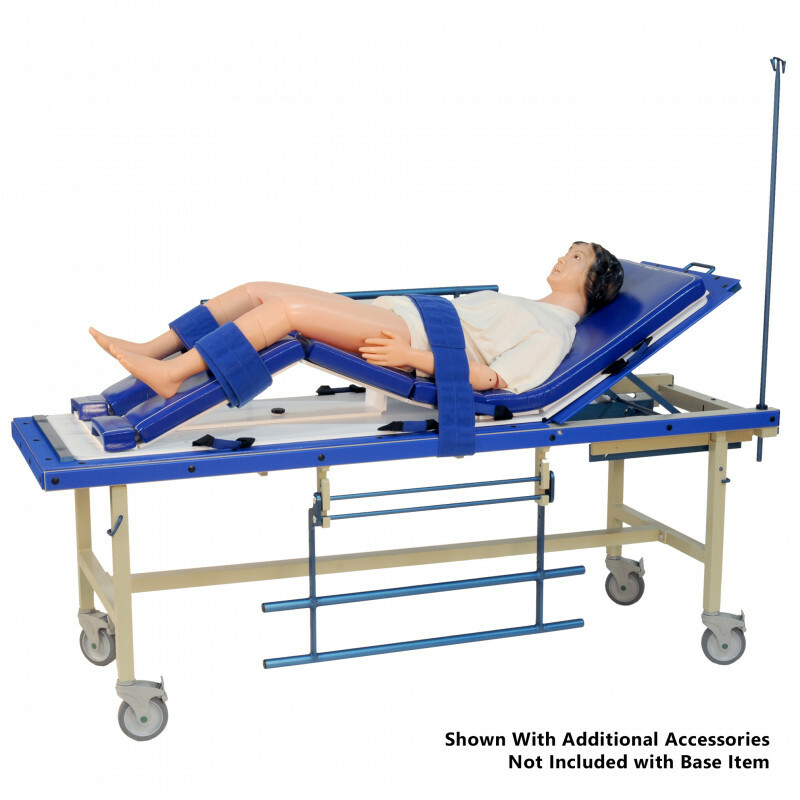 This treatment bed is MR conditional to 3T and can also be used for TBI or HDR treatment. The Slessinger board (Item 946-004) will work with this bed and can also go into an MR suite. When using the Slessinger board with the bed, a stop mounted into the keyhole slots at the foot end of the bed will prevent the Slessinger board from sliding. This all aluminum, non-magnetic bed has an adjustable backrest for fowler positioning at 15°, 30°, 45° and 60° angles. The backrest can be adjusted to the angle needed by raising the backrest to the desired position. To lower the backrest, raise the backrest a little and pull knob at the end of the bed to lower. The flat, fixed end of the bed is 52” long and the adjustable backrest is 27” long. There are four slots on each side of the bed to allow for up to four sets of the optional 4” Universal Velcro Straps. Three removable aluminum plates, with Velcro attached, fit into the keyhole slots on the bed. These removable plates are used when one of the optional pads is being used and will prevent pad movement. The optional pads have Velcro mounted to the bottom of the pad which attaches to the Velcro on the removable plates. The collapsible guard rails are 11” high from the top of the bed and 36” long and can be locked in the up or down position. The bed height can be set at 28”, 29” or 30” with the four locking pins. With the optional 18” Leg Extensions (Item 182-304), the bed height can be set from 46” to 48”. The 5” non-magnetic, lockable casters make this unit easy and convenient for one person to maneuver. Universal Straps 2" Wide and will fit table 18 - 30" Wide.